PLEASE ANSWER ON LOOSE LEAF. a. influence with the gods. 2. Which of the following quotations contains a description of an epic hero? a. Laertes’ high standards for Odysseus. c. Odysseus’ lack of maturity. b. Laertes’ trust in Ulysses. d. Odysseus’ loyalty to his family. 4. Which statement most accurately describes the role of Zeus in Odysseus’ adventures? a. Zeus encourages Odysseus’ crew. b. Zeus controls the weather by which Odysseus sails. c. Zeus strengthens Odysseus’ enemies. d. Zeus protects Odyseus’ crew from harm. 5. Which aspect of Odysseus’ character keeps him from giving his heart to Calypso or to Circe? c. He is incapable of love. b. He is eager to get back to Ithaca. d. He prefers the sea to the land. hoping the Cyclops will offer? 7. Which is the best rephrasing of the following lines? a. When dawn first broke / the Cyclops built a fire. b. At daybreak, the Cyclops built a fire. c. When Dawn touched the world with her rosy fingertips, the Cyclops built a fire. d. Sun rises. Cyclops builds fire. 8. 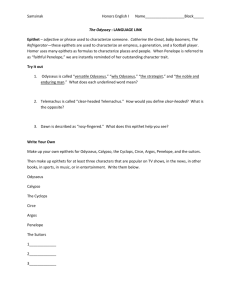 Which trait does Odysseus demonstrate by lying about his name to the Cyclops? 9. What is the meaning of Polyphemus’ words in the following lines? a. Let Odysseus return home without his companions. b. Odysseus will sail home under a strange sail. c. Let Odysseus return home, alone and troubled. 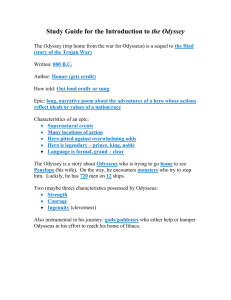 d. Curse Odysseus with a difficult journey home. a. resists the temptations of Calypso and Circe. b. refuses to taste the honeyed Lotus plant. c. ties his men beneath the Cyclops’ rams. d. weeps upon meeting Elpenor’s ghost in Hades. ____ 11. Which character trait does Odysseus display when he listens to the Sirens’ song? ____ 12. If written out in prose, how many sentences do the following lines equal? floated free; the mast, too, broke away. Which of the following is an example of a simile? a. Odysseus in one motion strung the bow. b. Odysseus stood watching the unruly suitors like a captain surveying a rough sea. c. The suitors, both strong and weak, tried and failed to string the bow. d. The setting of the epic is the Greek isles. Which of the following sentences best summarizes the Argus episode? a. Odysseus fails to recognize his faithful dog Argus who then dies of neglect. b. A dog named Argus is near death and lies unnoticed by his former master, Odysseus. of Odysseus’ voice, and then he dies. 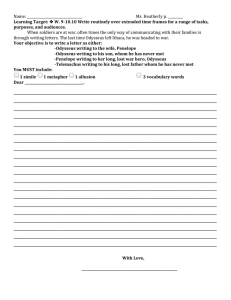 d. Before Odysseus can wean his dog Argus back to heath, the neglected animal dies. 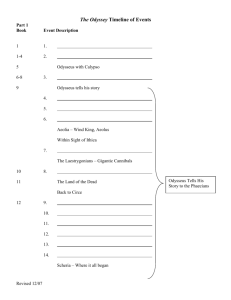 a. the length of Odysseus’ absence from home. b. Eumaeus’ awareness of Odysseus’ disguise. c. Argus’ undying loyalty to his master. d. the qualities that people and animals have in their youth. ____ 18. 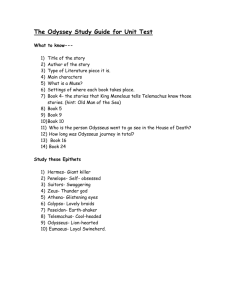 Which of Telemachus’ actions best demonstrates his obedience to his father? ____ 19. What is one result of Odysseus’ initial exchange with the suitor Antinous? a. Telemachus removes all the shields and weapons from the hall. b. Penelope summons the “beggar” Odysseus and questions him. c. The swineherd Eumaeus discovers Odysseus’ identity. ____ 20. The episode in which Penelope invites the old beggar to her room is important because it ____. ____ 21. Why does the disguised Odysseus make up a story and tell Penelope that her husband will be home soon? ____ 22. 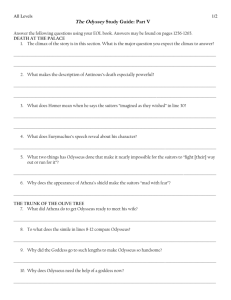 Which character traits does Penelope reveal in Part 2 of the Odyssey? ____ 24. Choose the phrase that best defines epic simile. ____ 25. Which is an important theme in the Odyssey, Part 2? a. Good triumphs over evil. c. The quest for power never ends. d. Old age triumphs over youth. ____ 26. 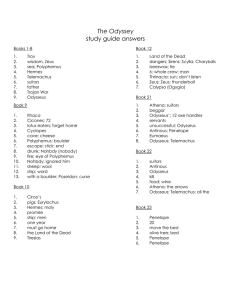 Which of the following best summarizes the conflict in Part 2 of the Odyssey? a. Odysseus fears his return to Ithaca will result in a civil war. d. Odysseus must choose between his loyalty to the gods and his affection for his family. a. restate all events in his or her own words. b. retell the plot briefly in his or her own words. c. list major events as briefly as possible. d. identify causes and effects for all events and happenings. ____ 28. Which of the following statements is true? a. Odysseus was able to assuage the winds that blew him off course. c. The Sirens plundered Odysseus’ ships. d. A squall forces Odysseus and his men into the land where Helios keeps his cattle. ____ 29. Choose the item with the words that correctly complete the following sentence. Odysseus acts ___ a hero in challenging situations, and he expects his crew to act ___ he does. Two terms that best describe the Cyclops and his actions are ____ and ____. Which of the following sentences contains an error in the use of like, as, or as if? a. It seems as if Odysseus’ crew would be killed by Cyclops. b. They hung like monkeys underneath the rams. c. Odysseus did not sail home soon like he thought he would. d. The sack of winds first seemed like a gift. Despite Calypso’s ____ for him, Odysseus insists on returning to Ithaca. a. Scylla made the sea burn like a crackling fire. b. It seemed like Odysseus would never get home. c. Every new danger seemed as if it would be the last. d. The men spent much of their days as oarsmen. b. trying to befriend him. a. hidden his identity from Telemachus and others. b. forgiven the suitors instead of killing them. c. left Ithaca and kept on traveling. d. lied about why it took him so long to get home. a. angry that his father dared show up after so many years. c. disappointed that he had not recognized Odysseus earlier. d. unable to believe the news. Which pair of words correctly completes the following sentence? They sailed ___ the billowing waves, traveling ___ the two overhanging cliffs. ____ 38. To be maudlin is to be ____. ____ 39. Which of the following sentences contains an error in the use of among and between? a. There is unrest between the many suitors. b. They talk among themselves to plot Telemachus’ murder. c. There is a fight between Odysseus and Eurymachus. d. Penelope is not sure she can tell the difference between Odysseus and an imposter. ____ 40. Which of the following sentences contains an error in the use of among and between? a. The goddess Athena could tell the difference between Odysseus and a beggar. b. Argus had been the swiftest and strongest between all the dogs. 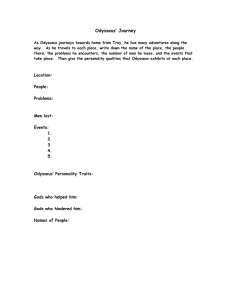 c. Telemachus thinks that Odysseus stands among the gods. d. Odysseus is not recognized among the suitors. to the person who recognizes Odysseus. asks for food. Explain why one of the suitors rebukes Antinous for this action (lines 1252–1259). the gesture made by Ulysses (Odysseus)? Explain your answer. a. Penelope really had an apron; Ulysses did not. b. Penelope’s gesture is authentic; Ulysses’ is calculated. c. Penelope represents all women, while Ulysses represents all men. d. Penelope’s gesture is ancient; Ulysses’ is contemporary. 45. In “Ithaca,” why does the speaker suggest that the reader pray that the road to Ithaca is long? fits this sentence. Then define each word in the answer. thinks they are far away and may be concerned with other affairs besides the events on Ithaca. dies. The dog’s last action is his final expression of loyalty to Odysseus. away; Ulysses’ more calculated gesture shows the assembled throng that he is too moved to speak. 30. Sample answer: Students should explain that Cavafy uses the journey to Ithaca as a metaphor for life. beached means washed up and lying on a beach.